Six conservation groups have filed a lawsuit in Federal Court over the Canadian government's failure to issue an emergency order to protect B.C. 's endangered southern resident killer whales. The application names the federal fisheries and environment ministers as respondents and asks for a court order compelling the government to recommend emergency protection for the whales and their habitat. 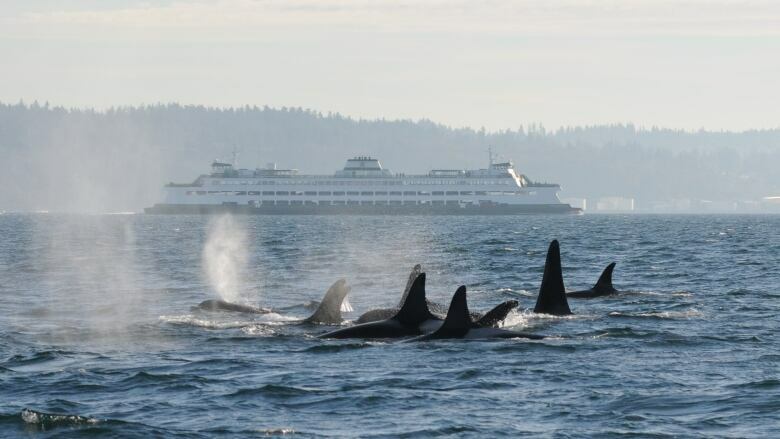 "Emergency orders are specifically designed for circumstances like this, when you have a species that needs more than delayed plans and half-measures to survive and recover," Christianne Wilhelmson, executive director of the Georgia Strait Alliance, said in a written statement. In May, Environment Minister Catherine McKenna and then Fisheries Minister Dominic LeBlanc said the population faces "an imminent threat to both survival and recovery." According to the Species at Risk Act, "The competent minister must make the recommendation [for an emergency order] if he or she is of the opinion that the species faces imminent threats to its survival or recovery." Only 75 members of the population remain, and no successful births have been documented since 2015. The southern residents are genetically and behaviourally distinct from other killer whales in B.C., and feed primarily on salmon. The plight of the whales attracted worldwide attention this summer, after the female orca known as J35 spent 17 days carrying her dead calf as she travelled through West Coast waters. That display, "showed us the devastating consequences of inaction on this issue. Her calf survived only half an hour, following three years of unsuccessful births in the population," according to Dyna Tuytel, a lawyer with Ecojustice. Another member of the same orca pod, three-year-old J50, is severely emaciated, according to scientists. Earlier this week, biologists used a dart to inject the young whale with antibiotics in an attempt to save her life. However, experts say they haven't seen a whale this sickly survive for so long before. Lawyers with Ecojustice filed the Federal Court application Wednesday on behalf of the David Suzuki Foundation, Georgia Strait Alliance, Natural Resources Defense Council, Raincoast Conservation Foundation and World Wildlife Fund Canada. In a written statement, Fisheries Minister Jonathan Wilkinson said the federal government is fully committed to protecting species at risk. "Our government has taken unprecedented sustained, ambitious action over the past two years to protect and recover the Southern Resident Killer Whale," Wilkinson said. He cited the government's $167-million Whales Action Plan, announced earlier this year, which includes restrictions on Chinook fisheries, moving shipping lanes and implementing vessel slowdowns, and funding for research.